15 Whole30 Ham Recipes: Get Piggy With It For Your Program Ham! 15 Whole30 Ham Recipes: Get Piggy With It! Ham is a protein staple and a great food choice for many healthy, clean eating meals, including Whole30. Ham can be very versatile, enjoyable on its own or with the help of flavoring – see for yourself with our collection of the best Whole30 ham recipes! 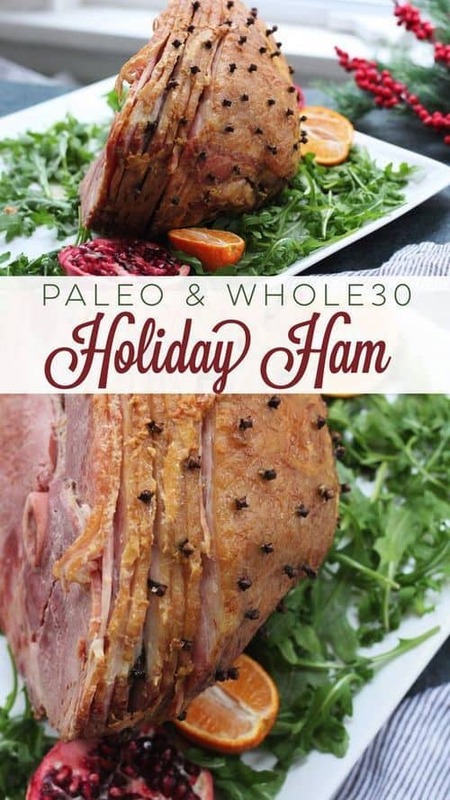 Paleo Bailey creates a to-die-for recipe for Whole30 Holiday Ham. This recipe uses only 3 easy-to-find ingredients. All you need are holiday ham, sugarless brown mustard, and cloves to make this magnificent ham dish for that special occasion! Perfect for Easter brunch or Christmas dinner. A Whole30 glazed ham? 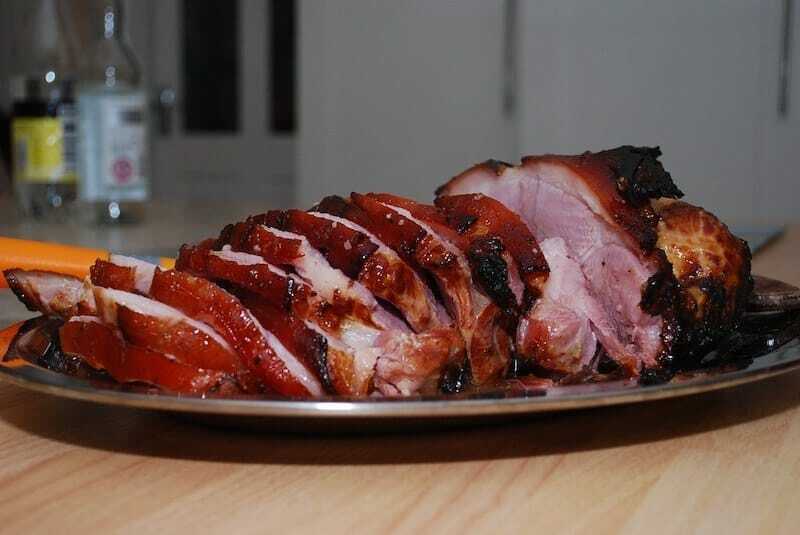 The Real Food Dietitians did it with this recipe for an Orange Glazed Ham. This meal has uncured sugarless smoked boneless ham, frozen orange juice concentrate, dried ground ginger, and cloves. Top it off with any Whole30 sauce for an extra kick! 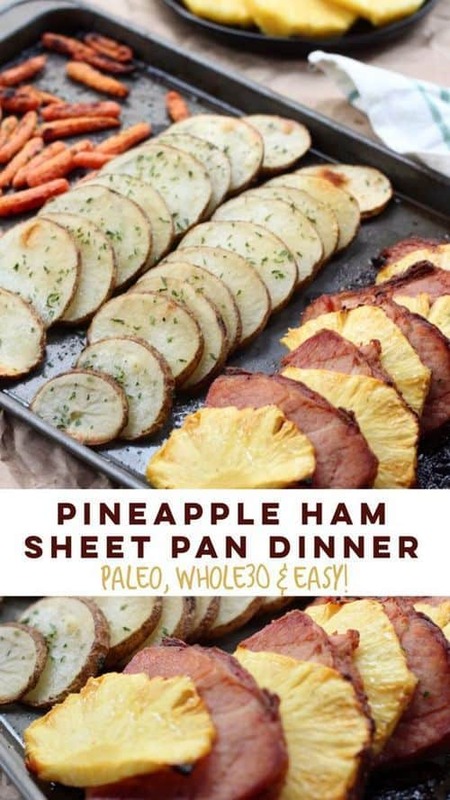 Enjoy a Pineapple Ham Sheet Pan Dinner with this recipe from Paleo Bailey. This dish is made with holiday ham, white potatoes, pineapple, baby carrots, olive oil, dried parsley, and garlic powder. With just the right blend of sweet and savory, this recipe is a great party pleaser! Can you ever go wrong with the classic green beans and ham? Savory Tooth created a very simple recipe for Instant Pot Green Beans and Ham. Only 4 ingredients! Green beans, ham, red onions, and garlic come together to form a delicious and healthy dish that’s ready in minutes! 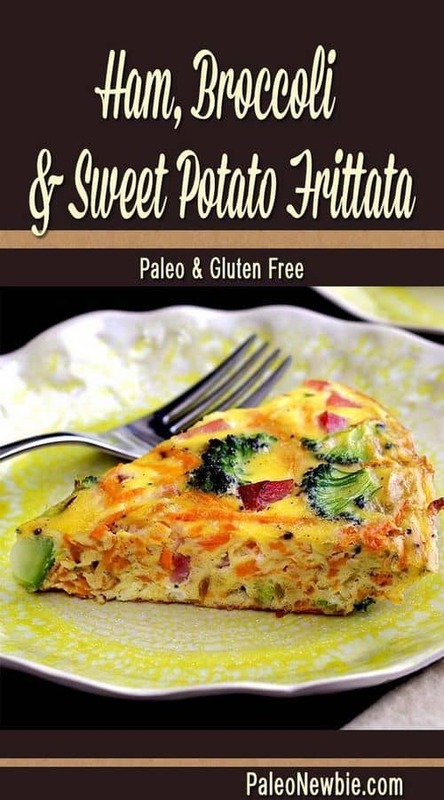 This recipe for Ham, Apple & Sweet Potato Scramble comes from Paleo Newbie. With ham steak, apple, sweet potato, onion, eggs, coconut oil, cinnamon, and seasonings, you will get a taste like no other! Frittatas are a great way to incorporate ham in your Whole30 diet. Check out this fabulous recipe from Paleo Newbie. Ham, broccoli and sweet potatoes come together with eggs, full-fat coconut milk, and coconut oil for this paleo-friendly treat. 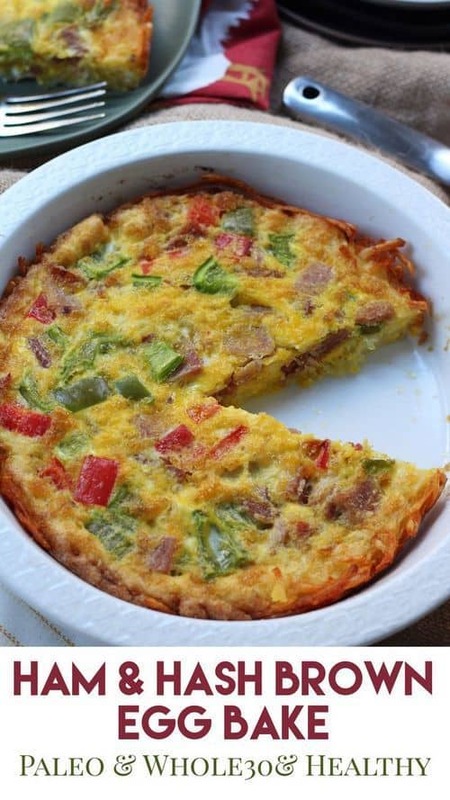 Start cracking those eggs for your perfectly healthy and fluffy ham frittata! Paleo Bailey once again brings us a Whole30 ham recipe! This time, it’s Ham & Hash Brown Egg Bake. This recipe calls for hash browns, ghee, ham, eggs, pepper, red pepper, onion, almond milk, and dried parsley. This baked egg is super easy to make and freezes really well. Make this recipe ahead of time! 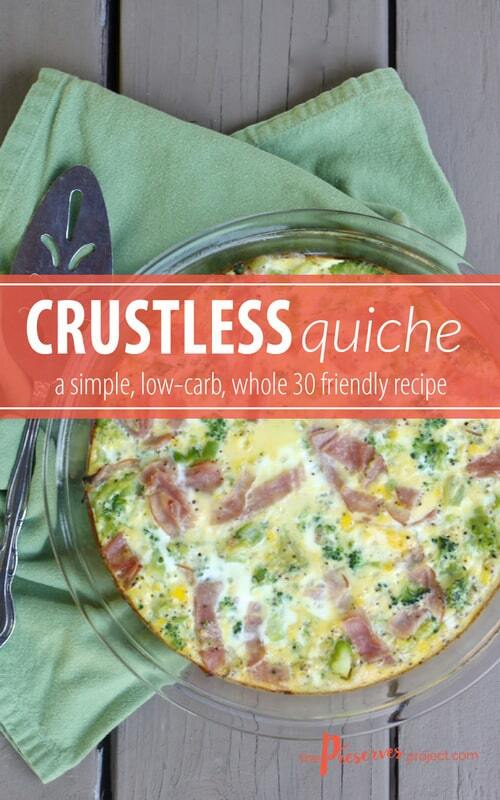 Switch up your egg ham dish with this Crustless Quiche with Broccoli and Ham from The Preserves Project. Even better? This recipe uses only 4 ingredients! Eggs, broccoli, ham, and ground mustard are all you need to create this vibrant and flavorful egg dish. When you’re too busy in the morning to spend time in the kitchen, you know you need a good make-ahead recipe! 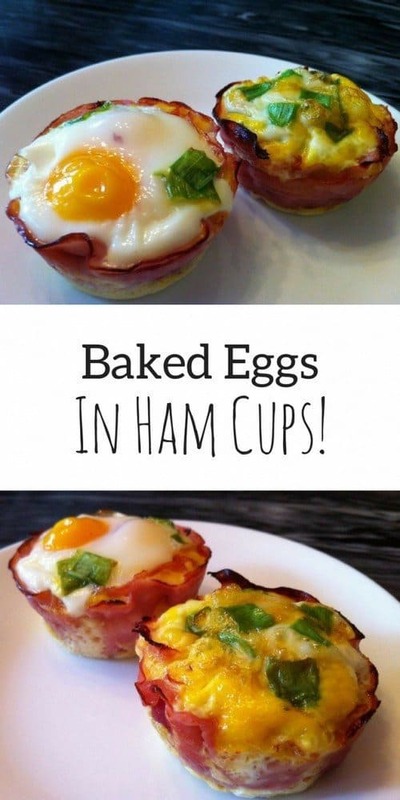 Here’s a good one – Baked Eggs in Ham Cups. Oh Snap! Let’s Eat! created this recipe by using 2 simple ingredients: eggs and ham. It’s quick and fool-proof; the best egg dish for your busy mornings! Every spoonful of a comfort soup brings back warm and cozy memories. That’s what this Sweet Potato, Ham, and Kale Soup with Rosemary from Heart Beet Kitchen is all about! Olive oil, onion, garlic, rosemary, sweet potatoes, ham, homemade chicken broth, and kale come together to give you a taste of home. I Breathe I’m Hungry created a simple and unique Whole30 ham soup. This Creamy Cauliflower & Ham Soup is made with cauliflower, ham stock, garlic powder, onion powder, ham, apple cider vinegar, thyme, and ghee. Satisfy your creamy soup needs with this mouthwatering recipe! 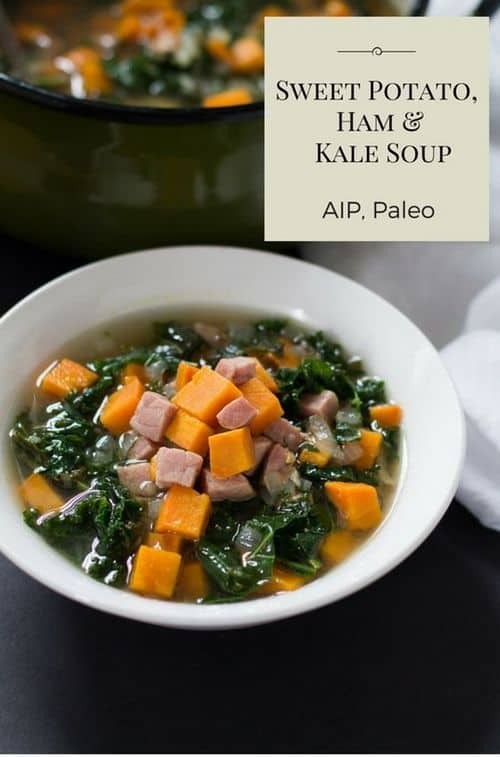 This recipe for Slow Cooker Ham and Veggie Soup originates from Paleo Bailey. It requires the following ingredients: potatoes, yellow onion, carrots, celery, ham, thyme, parsley, garlic, chicken broth, Nutpods Original, and tapioca flour. So, if you still have those holiday leftovers, don’t throw them away! Instead, transform them into this heavenly soup! Looking for a faux bean soup? You’re going to love this White No-Bean Ham Soup from The Castaway Kitchen! 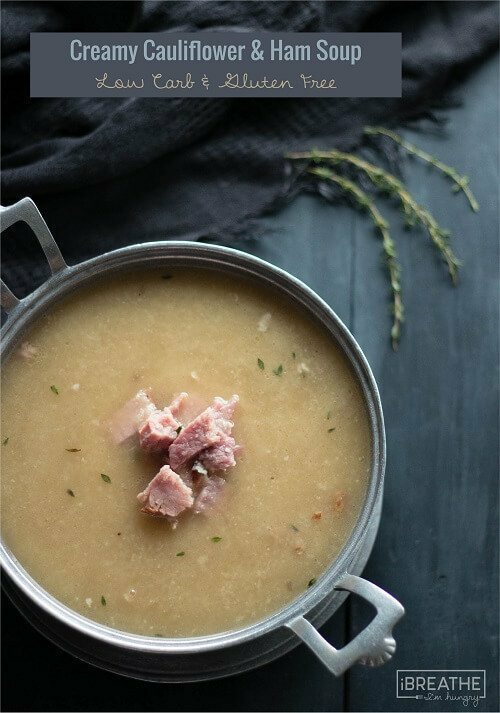 This recipe only uses 4 simple ingredients: cauliflower, bone broth, smoked ham, and bay leaves. Decadent and nutritious, it will keep you satisfied! The Real Food Dietitians created a Ham and Potato Soup to satisfy your cravings for a creamy yet dairy-free soup. 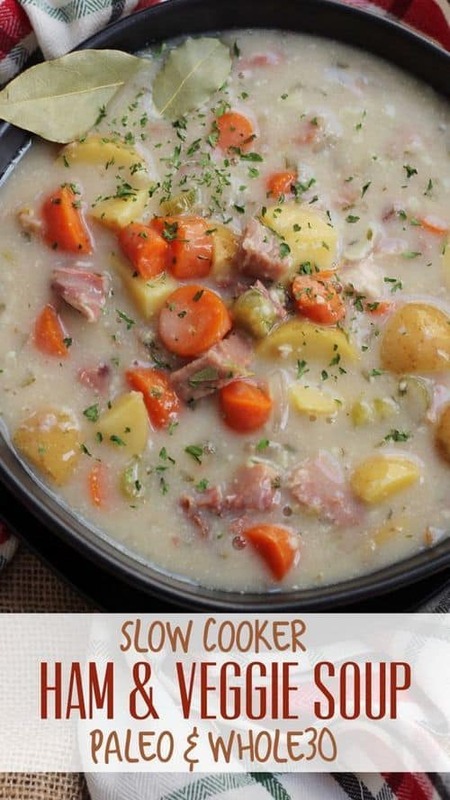 This recipe uses cooking fat, yellow onion, celery, carrots, leek, garlic, red potatoes, chicken broth, dried thyme, ham, and kale. Pre-chop the vegetables and keep them in your fridge until you’re ready to whip up a batch! Make some Crock Pot Parsnip Ham Chowder for a special occasion. Cotter Crunch created this fancy chowder using parsnips, sweet potato, onion, olive oil, garlic, basil, chicken broth, smoked ham, almond milk, potato starch, and coconut aminos. Rich and packed with flavors, this recipe will not disappoint! We hope you enjoyed our collection of Whole30 ham recipes. Let us know which one you want to try first! Did we miss any of your favorites? Share your top dishes in the comments below! 15 Whole30 Pork Chop Recipes: Juicy Pork Joy!